Alliance players need to unlock Nigel Rifthold as a vendor. Head to Anyport (western coast of Drustvar), and purchase 10 Tirasreli Gourmet Chocolate from Xun Xun Sweetflower. Travel to 52,31 in Drustvar (west of Fallhaven, just above the "F" in the name), climb up a small hill and enter a tree house. Loot the chest, and then loot it a second time (will consume the Gourmet Chocolates), and Nigel will appear as a vendor. Players must first complete Abby Lewis' quest chain before this pet will appear on the vendor. Good news; Blizz reverted Smoochums' appearance back to his original model as of Dec,. 19th! For those disappointed by the Smoochum appearance change, it has been reverted back to the original model. 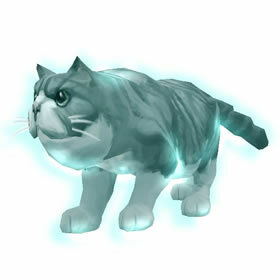 As of 8.1, Smoochums' appearance was changed to a normal "ghost cat" appearance. This change made me really sad because I actually prefered the original look, and now, I find myself not even wanting to summon him. Horde players can also complete the chain quest to unlock and buy Smoochums. Can anyone confirm if HORDE can do this to unlock the cat and pig???? "tea party" seems to have a lot of potential, it doesnt say so in the tooltip but the total damage for each pet (~120) is split into 2 attacks. When used against a full team smoochums goes around 2 times, hitting each pet once each time. Smoochums loved life in Glenbrook, it was full of people to play with and places to sleep, and also where unspeakable acts happen at the most innocent of tea parties.